Take extra care when handling these precision electronic components. 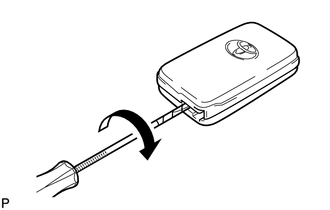 (a) Push the release hook knob and extract the mechanical key. 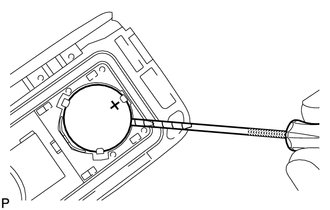 (b) Insert a precision screwdriver into the gap, and turn the screwdriver to detach the transmitter housing cover. 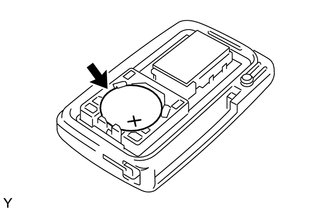 (c) Insert a precision screwdriver into the gap and gently remove the battery (lithium battery: CR1632). 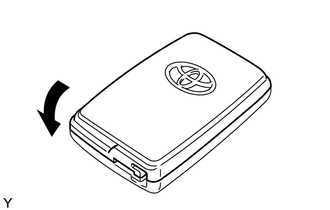 (a) Install a new battery (lithium battery: CR1632) with the positive (+) side facing upward, as shown in the illustration. 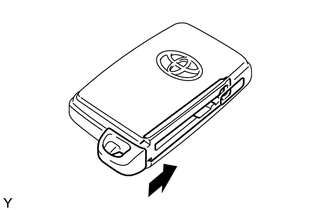 Do not bend the transmitter battery electrode during insertion. 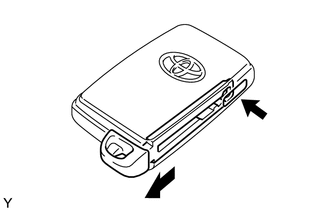 (b) Install the transmitter housing cover by pressing down on it as shown in the illustration. (c) Insert the mechanical key into the transmitter. (d) Press one of the transmitter switches and check that the LED illuminates.